Anne Lloyd Francis (1930–2011) was an American actress. 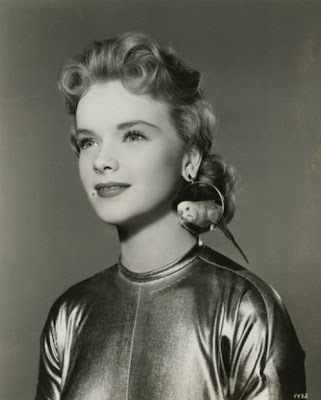 Francis was best known for her role in the science fiction film classic Forbidden Planet (1956) and for starring in the television series Honey West (1965–1966) which was the first TV series with a female detective character's name in the title. She won a Golden Globe and was nominated for an Emmy award for her role in the series. 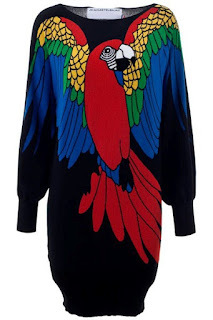 The lovely and colourful PARROT label was established in 1898 by Fredrik Löwenadler at Jönköping-Vulcan match factory. It has been a famous match brand in Panama since 1911. The phosphorus match was known at least around 1820. Manufacture began in many European countries in the 1830s. 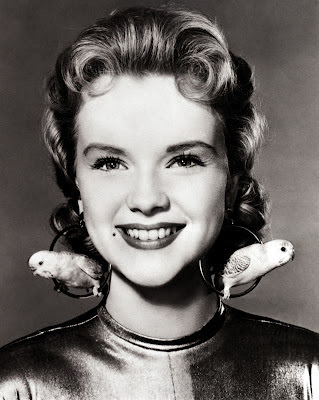 These matched could be struck against any type of surface. The disadvantage was that they caught fire too readdily, causing countless accidents. In 1836, the chemical factory J.S. Bagge & Co:s Kemiska Fabrik i Stockholm was established. One of the managers, Gustaf Erik Pasch, experimented with matches and phosphorus. 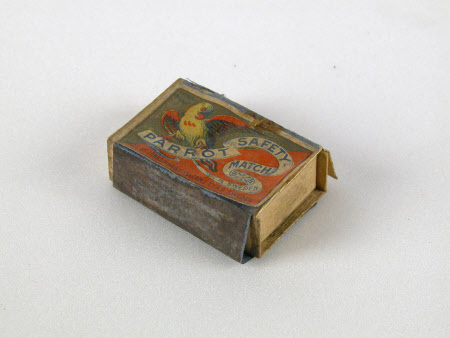 In 1844, he started producing his patented safety matches. In 1844, the Swede Gustaf Erik Pasch succeeded in separating the components required for ignition between box and match stick, and the world's first safety match was patented Oct 30, 1844. The Swedish saftey match perfected and patented in 1852 by Johan Edvard Lundström and his brother Carl Frans Lundström was a further improvement on Pasch's invention. This match received a medal at the World's Fair in Paris 1855. The Swedish matches where recognized throughout the world as market leading in quality and safety. During the 1860s and 1870s development was rapid and the making of matches was transformed from a handicraft to a large-scale industy. In Sweden there were as many as 155 factories! In 1903, a number of match factories united as "Jönköping & Vulcan". In 1913, eight competing factories united to form AB Förenade Tändsticksfabriker, headed by Ivar Kreuger. 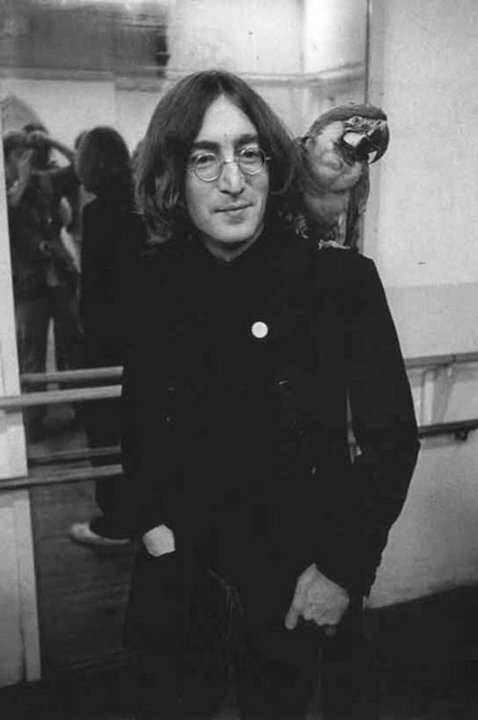 Kreuger was a member of the family that operated the group known as the "Kalmar factories". During World War I, the supply of raw material was cut of and the match business went down. A strategy was formed to acquire companies in the supply chain, like paper mills, machine manufacturers, etc. to secure the production. In 1917, Jönköping & Vulcan was invited by Kreuger and his associates to merge with the company. The result was named Svenska Tändsticksaktiebolaget, STAB, (changed to Swedish Match in 1980). 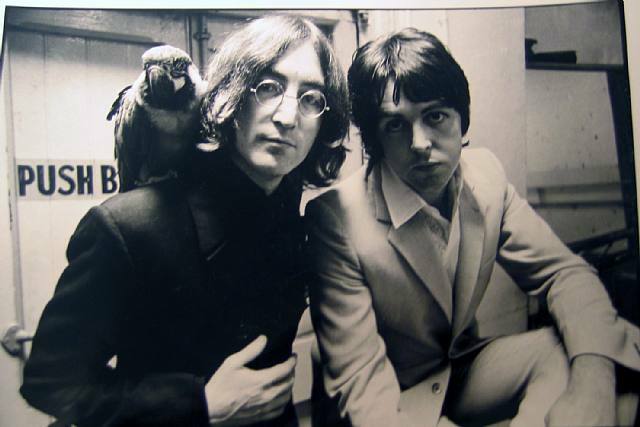 The company has evolved into the world leaded in the match market. During World War I, Jönköpingstrusten and STAB was united. At the end of the Kreuger era, STAB controlled more than 50% of the total match production in the world. In 1915, Svenska Tobaksmonopolet, STM, was founded and was a part of Statsföretag AB. 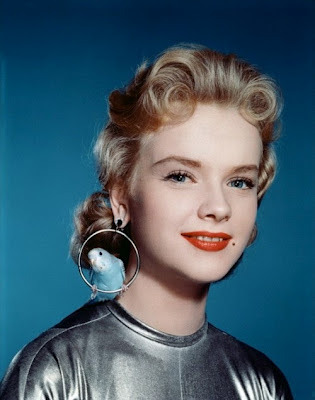 In 1984, changed to Procordia. 1992 Procordia acquires Swedish Match. Arenco, founded in 1877, was incorporated in Svenska Tändsticks AB (STAB) in 1917 with a diversified product range covering, apart from match machinery, also packaging and fish processing machines. The quality of the products has always been considered to be in top position. The first continuous match dipping and box filling machine was invented in 1864 by the Swede Alexander Lagerman. From 1919, over 400 continuous match dipping machines have been sold worldwide. Out of these, 3/4 are still in use today. Done in white gold set with white diamonds and multi-colored sapphires. 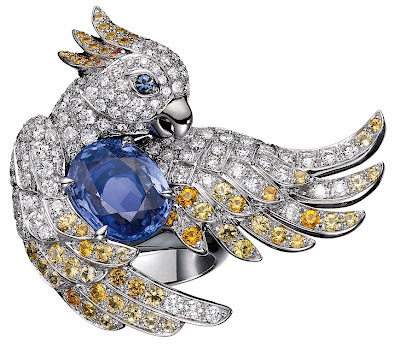 The parrot has a 4.5 ct blue sapphire as a central stone. Pottery Mound was a late prehistoric village on the bank of the Rio Puerco, west of Los Lunas, New Mexico. It was an adobe pueblo most likely occupied between 1350 and 1500. 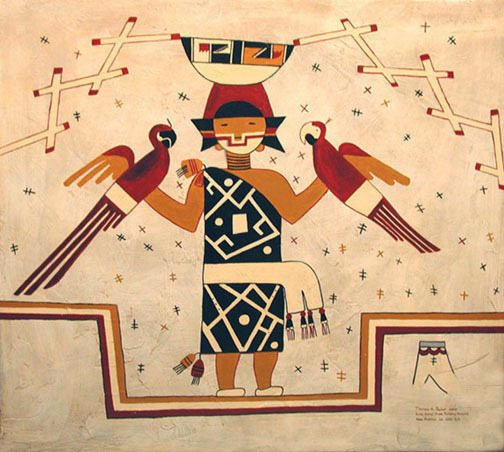 The site is best known for its 17 kivas, which yielded a large number of murals. It has the greatest variety of pottery of any prehistoric site in central New Mexico. Imported pottery includes Hopi decorated and plain wares, white paste wares from the Acoma-Zuni region of west-central New Mexico, and biscuit wares from north-central New Mexico (Franklin 2007). Pottery Mound is named after the large number of potsherds lying on the site surface, and after its low mound of melted adobe. The site was part of the Rio Grande Glaze Ware tradition that began ca. 1315 and continued until the time of the Spanish reconquest of New Mexico in 1693. The site's signature pottery, Pottery Mound Polychrome, includes red and black paint on a background consisting of two slip colors (on bowls, one slip color on the inside and the other on the outside). As is typical in the southern part of the glaze ware production area, Glaze A pottery (simple rim forms) predominates (Franklin 2007). The mural depicts a woman wearing ceremonial face paint holding a pair of scarlet macaws. 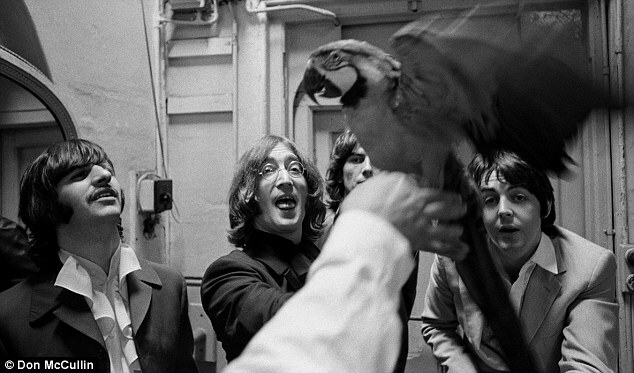 These large, colorful parrots were not native to the American Southwest, but were imported to Pottery Mound from the tropical forests of Central and South America, hundreds of miles away. The brilliant colors of the birds' feathers created a striking contrast to the pervasive dull earthtones of this land of desert scenery, which made them especially prized by the people of Pottery Mound, if we may judge from the numerous times they appear in the ancient Pottery Mound murals. The theme of bringing rain, or calling upon the supernatural to deliver it, is evident throughout this painting, with lightning flashing from a painted bowl balanced on the woman's head and insects associated with water--mosquitoes and dragonflies--surrounding her. 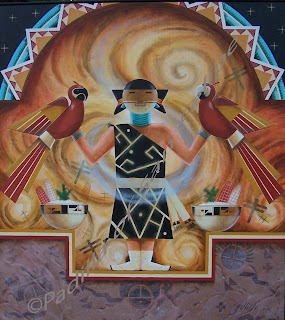 She wears a dress of cotton fabric with a typical white Anasazi pattern woven into it, and around her waist is a sash trimmed with tassels. The meaning or identity of the fragmentary object at the lower right of the painting is unknown. 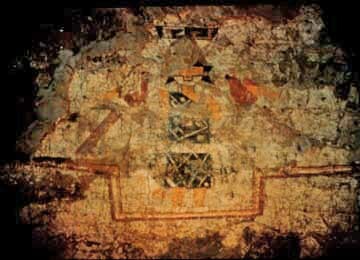 The painted stripes upon which the girl stands probably extended all the way around the room and connected this paintings to other ones in the kiva. 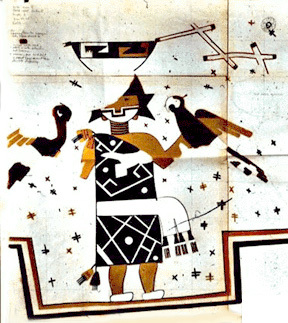 Original Parrot Woman mural as it appeared during excavation at Pottery Mound. 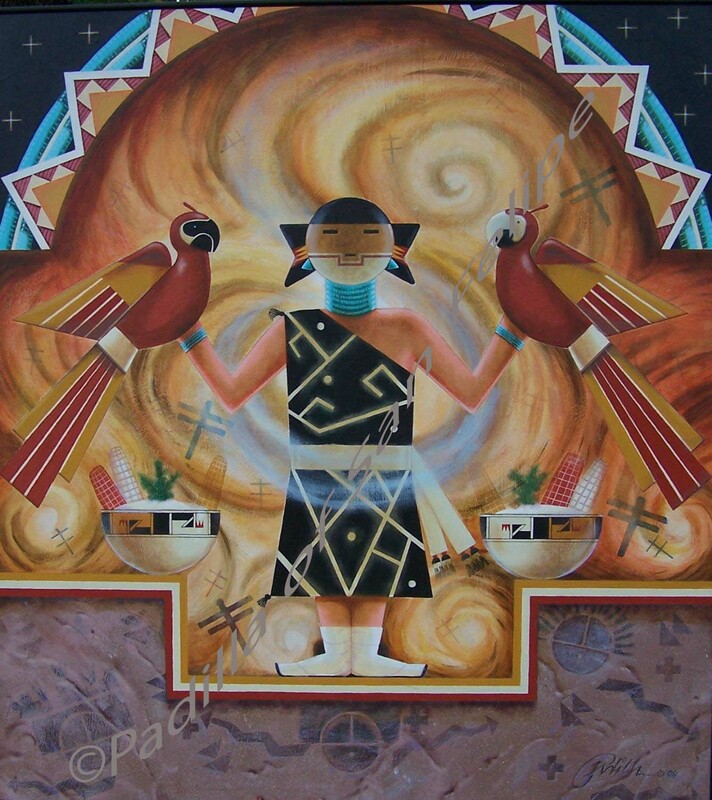 Reproduction of an Anasazi Indian kiva mural by Thomas Baker. Art by Fernando Padilla, Jr.; Padilla of San Felipe. 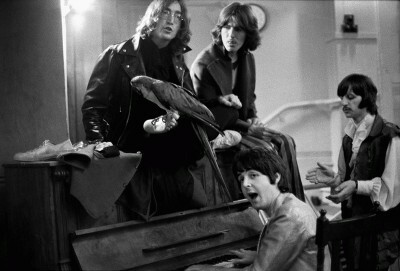 The Beatles rehearse around the piano as a parrot rests comfortably on John’s Lennon’s foot at the Mercury Theatre in Notting Hill Gate, London, circa 1968. 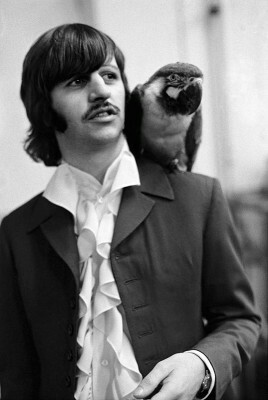 Beatles drummer Ringo Starr with a parrot on his shoulder at the Mercury Theatre in Notting Hill Gate, London during the weekend of July 28, 1968. A Mad Day Out in London with the Beatles. John Lennon with Parrot and Paul Mc Cartney, 1968.